First, to my subscribers, thanks for your understanding about the email glitches yesterday. I really appreciate all the supportive emails so many people sent. Your kind words turned a frustrating day into a great one. I haven’t posted anything new on the blog for awhile because I was teaching a workshop, and then working on our new website. The new site is still a bit of a work in progress, so if you find any broken links or other issues please let me know. But the new site better integrates the blog with the other content, makes it easier to add and update portfolios, and will work much better with phones and tablets, so I hope it will be a better experience for everyone. Meanwhile we had a great workshop, with flowing waterfalls, fresh spring greenery, dogwoods, and some interesting weather and clouds. And the cool, showery spring weather has continued, which I love. 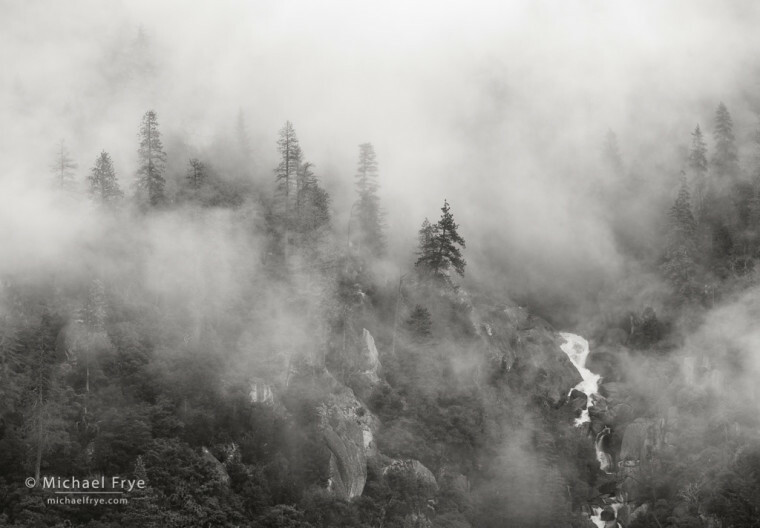 I’m not ready for the summer heat, and always happy to have clouds and mist to photograph. Since Yosemite is so beautiful Claudia and I spent last weekend in the park, staying at a friend’s house. 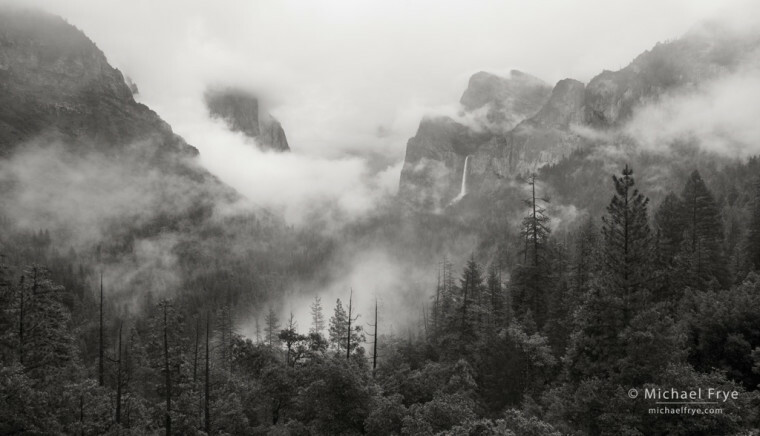 Friday and Saturday were mostly overcast, with occasional showers, and periods where mist wrapped itself around the valley cliffs. Sunday morning dawned clear – too clear it seemed at first. I was hoping for both low-lying mist and high clouds, but didn’t see either when I left our friend’s house. However, as I made my way around the valley I found some mist in the meadows. 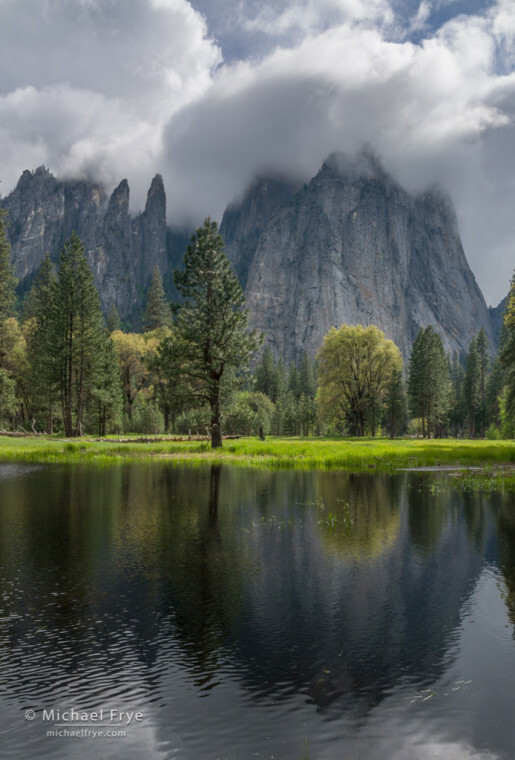 I decided to stop at Gates of the Valley (Valley View) because there was a little fog across the river in Bridalveil Meadow. And then, soon after I set up my tripod, some beautiful high clouds started passing overhead, lit by the rising sun. Nice. 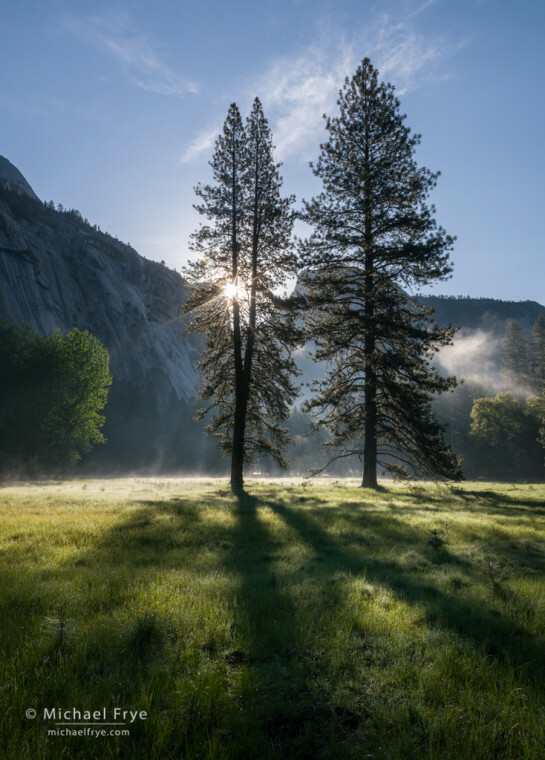 But the best part was later, when the sun appeared in the gap between El Capitan and Cathedral Rocks, and lit the mist rising off the meadow. Those images turned out to be my favorites of the morning, especially the one at the top of this post. The contrast in that scene was extreme, so I bracketed exposures. I also wanted a really wide view, which required stitching four frames together into a panorama. So I actually used both Lightroom’s HDR Merge and Panorama Merge to assemble the final image. First I ran the HDR Merge on each of the four separate bracketed sequences. Then I took those four merged HDR DNG files and ran them through the Panorama Merge. This was the first time I had tried both the HDR Merge and Panorama Merge with the same photo, and it worked really well. The only issue – a common one with panoramas – is that there were some visible seams in the water where the waves from one image didn’t quite match up with the waves from the adjacent image, requiring some cleanup work with the Spot Removal tool. Speaking of the waves, I also used a four-stop neutral-density filter to slow the shutter speed and smooth out the water. The shutter speeds for the bracketed images were 1/10, 1/3, and 1.5 seconds (all at f/16, ISO 100). The HDR Merge used the 1.5-second exposures for darker areas, including the river, which gave the water that smooth texture. With turbulent water like this a fast shutter speed would have made the water look choppy. The slow shutter speed created a softer look and feeling which seemed to fit the mood of this scene better, and also helped to simplify the image by eliminating a lot of the water’s texture, which would have made the whole bottom part of the photograph rather busy. Soon after I made that image the mist began to dissipate, so I moved to the eastern end of the Valley, looking for more fog and mist. You’ll find two more photographs from Sunday morning below, along with some other images made Friday and Saturday. There were a lot of people in Yosemite over the weekend, but we didn’t mind, and really enjoyed our little weekend getaway. It’s been such a beautiful spring. P.S. 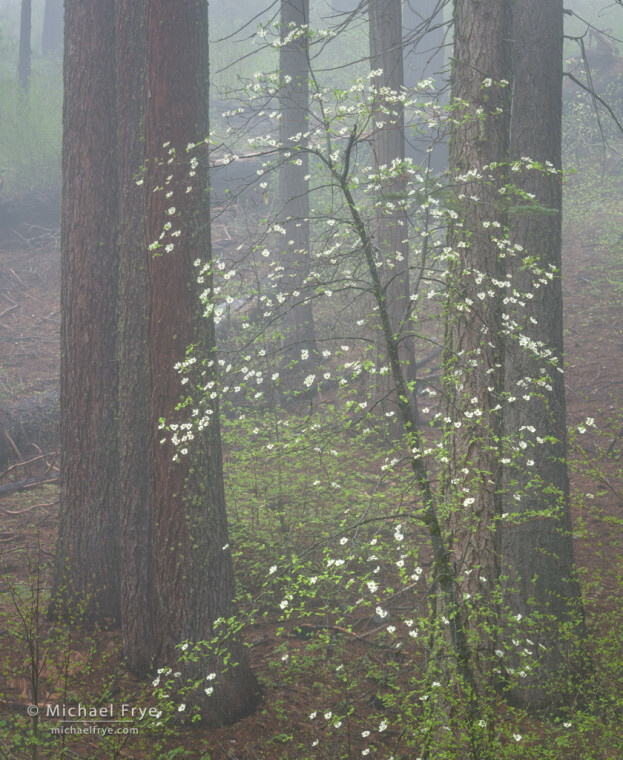 The dogwoods in the Valley were past peak, and their blossoms appeared rather tattered up close, but most of them still looked good from a distance. They won’t last much longer however. Higher-elevation dogwoods along highways 120 and 41 were a mixture, with some past peak, some in good condition, and others just emerging. There aren’t any big wildflower displays in and around Yosemite right now besides the dogwoods, but there are a variety of flowers still blooming in the foothills, some irises in the Valley meadows, bush lupines in brushy areas above and below the valley, and penstemons blooming among rock outcrops along the roads above the Valley. The Spring sunrise, Gates of the Valley is stunning! I’ll have to try the merge process sometime on some photos in my library. Glorious photographs, as always. The first one is really special with the sunburst and the soft, rushing water. Love the new site as well – very nice layout. Glad you had a great workshop during one of our better Spring seasons. This blog was worth the wait! All the photos are awe inspiring. Even though the techniques you used are way over my head, you produced a masterpiece with your Gates of the Valley. It gives a dreamy, whole new perspective to one of the most photographed views in YNP. You and Claudia are appreciated! Thanks as always for sharing the shots. I particularly liked the shot of Cathedral. Those particular clouds made it quite unique. I’ve done the dual combo of HDR and panos a number of times, and it works out nicely. I wish it were easier to send multiple different exposure panos to my preferred HDR program, Aurora HDR. But unfortunately, making the panos first can end up with images that vary in size which then throws HDR programs off. So, I do the HDR first and then the pano step which seems to be what works best. But then, that means sticking with Lightroom’s HDR to keep the DNG capability throughout. Thank you Doug! It definitely seems to be easier to merge the different exposures before creating a panorama, for the reason you point out – the panoramas won’t line up with each other correctly. Thanks so much, once again, for sharing your vast knowledge so generously. These pictures are stunning and the new website is excellent. Nicely laid and flows well. Superb images. Each and every one. I especially enjoyed this post. 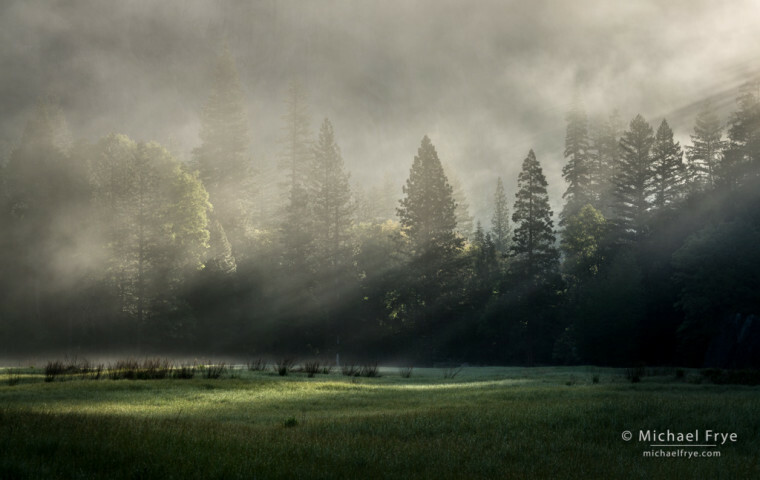 You are a master of using fog to enhance your imagery. The best I have seen. Thank you. Wonderful images! I especially like the Sunbeam and Fog. The lighting seems perfect. Thanks John – glad you like it! 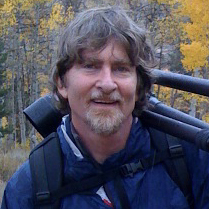 Hi Michael, thank you for sharing so much in your website, I learnt so much! This is such a wonderful image. I did some panoramas merging using both PS and LR, something I don’t like in the result is usually the cloud. The cloud looks a bit strange in my photo after merging, it looked curved, and I saw it in your photo here too. Did you notice it? I am wondering if there is way to improve it. You’re welcome Laura, and thanks. Panoramas can have some distortions, but I think it’s mostly because of the wide-angle view. In other words, if you used a really wide lens and cropped the image into a panorama, you’d see the same distortion as when using a not-so-wide lens and stitching several frames together. In my image here, the arch-shaped cloud doesn’t look distorted to me – it looks the way I would expect a cloud like that to look with a really wide lens. And in this case I like the curving shape much better than a straight line. If you don’t want the distortion you could try using the Perspective projection option for the panorama, but that never works for me – it’s usually worse. Otherwise I don’t know of a way to correct it. Distortion is an inherent quality of rectilinear fish-eye lenses, which is essentially what we’re looking at here. Thank you for your help here Michael. I do love panoramas and have been trying more lately. Gorgeous, Michael! My husband and I were in the Bay Area for a wedding and made the difficult choice due to time constraints to head south to visit Pinnacles and Monterey. I was celebrating the precipitation during our visit, even if it was raining too hard for any photographs of Pigeon Point Lighthouse. 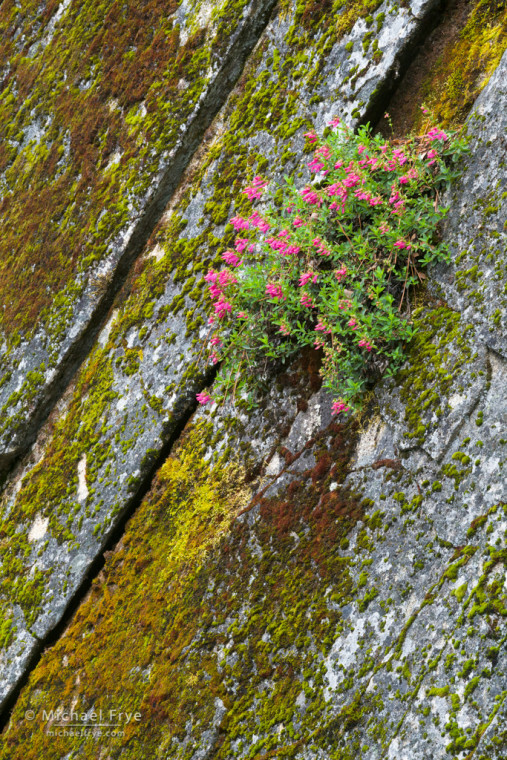 As always, I love seeing mist swirling around the valley, but I also really love that bit of penstemon growing out of the rock. Love the new layout of the website! I’ve been wondering about the use of HDR+Panorama at the same time too, so thanks for trying it. Congrats for the new site (it’s the first time I see it, since for a few weeks I hadn’t the time to consume my RSS feeds). Since you say that there could be some glitches, perhaps there’s a small problem… I see some of your photos blurred, the vertical ones; just looking at your logo, I understand they are upscaled. If I try to download them, I can see that their horizontal size is 545 pixels, but my browser (Chromium and Chrome on Mac OS X El Capitan( renders them wider (699 pixels): hence the upscaling. Maybe it’s wanted, maybe not; I’m just letting you know. Thanks for the feedback Fabrizio; we’re still working on getting the images to be sized correctly. Michael, I’ve got to stop following your blog. Your pictures are so breath-taking and, they make me miss this place so much!! Will try again next year. I already put a word in with “the boss,” Claudia. 😉 Oh, love the new site. No, don’t do that! 🙂 Thanks Florian. This is the 1st of your blog posts I’ve read – its excellent and I will definitely be bookmarking this site…. Great info and a technique I am now looking forward to trying. 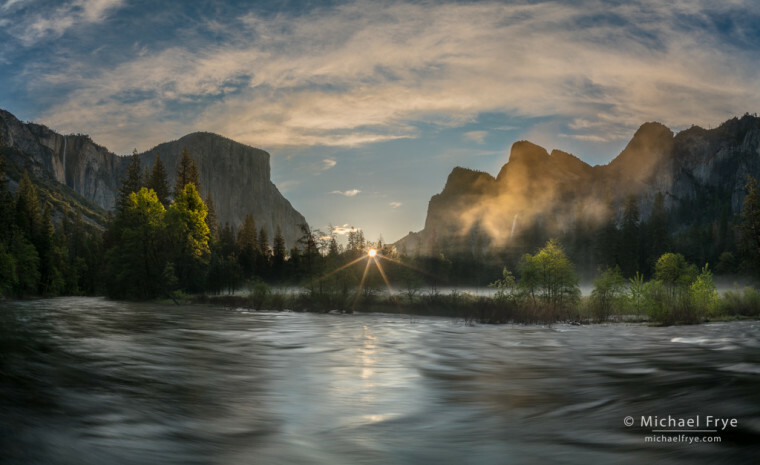 The beauty of Yosemite and your ability to capture it is always a pleasure to view. Love your idea of combining HDR and Panorama Merge. I’ve never combined them either. 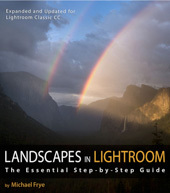 To all who read this, your Lightroom e book is invaluable! Every month or two I go back to re-read sections to practice the techniques. I’ve referred a couple of friends who are new to Lightroom, and they feel the same. Thank you for continuing to inspire and help us learn! Thanks so much Martin! I really appreciate the kind words, and I’m glad you like the ebook!